The Battle of Megiddo is the first battle that was recorded in detail and for posterity. Pharaoh Thutmose III's military scribe inscribed it in hieroglyphs at Thutmose's temple at Karnak, Thebes (now Luxor). Not only is this the first extant, detailed battle description, but it is the first written reference to the religiously important Megiddo: Megiddo is also known as Armageddon. Historically, Megiddo was an important city because it overlooked the route from Egypt through Syria to Mesopotamia. If an enemy of Egypt controlled Megiddo, it could block the pharaoh from reaching the rest of his empire. In approximately 1479 B.C., Thutmose III, pharaoh of Egypt, led an expedition against the prince of Kadesh who was in Megiddo. The prince of Kadesh (which is on the River Orontes), backed by the king of Mitanni, made a coalition with the heads of Egypt's vassal cities of northern Palestine and Syria. Kadesh was in charge. After forming the coalition, the cities openly rebelled against Egypt. In retaliation, Thutmose III attacked. In the 23rd year of his reign, Thutmose III went to the plains of Megiddo where the prince of Kadesh and his Syrian allies were stationed. The Egyptians marched to the bank of Lake Kaina (Kina), south of Megiddo. They made Megiddo their military base. For the military encounter, the Pharaoh led from the front, brave and impressive in his gilded chariot. He stood in the center between the two wings of his army. The southern wing was on the banks of the Kaina and the northern wing to the northwest of the town of Megiddo. The Asian coalition blocked Thutmose's path. 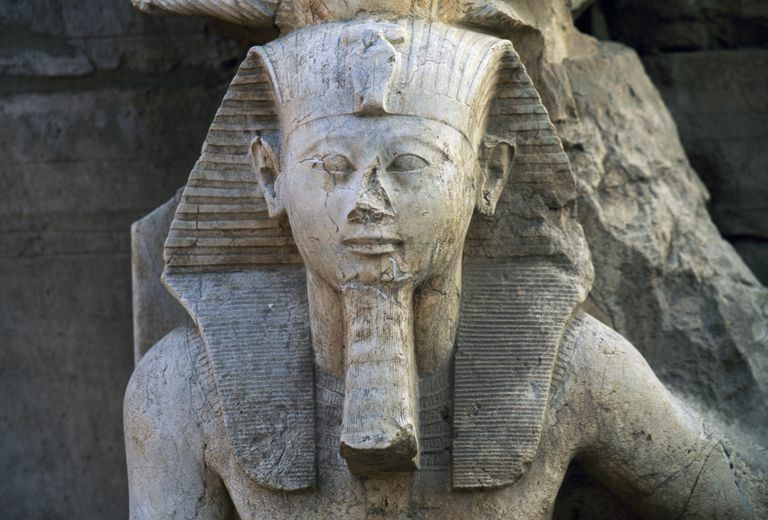 Thutmose charged. The enemy quickly gave way, fled from their chariots, and ran to the Megiddo fortress where their fellows pulled them up the walls to safety. (Remember, this is all from the perspective of the Egyptian scribe writing it to glorify his pharaoh.) The prince of Kadesh escaped from the vicinity. The Egyptians could have pushed on to Lebanon to deal with the other rebels, but instead stayed outside the walls at Megiddo for the sake of plunder. What they had taken from the battlefield may have whetted their appetite. Outside, on the plains, there was plenty to forage, but the people within the fortress were unprepared for a siege. After a few weeks, they surrendered. The neighboring chiefs, not including the prince of Kadesh, who had left after the battle, submitted themselves to Thutmose, offering valuables, including princely sons as hostages. The Egyptian troops entered the fortress at Megiddo to plunder. They took almost a thousand chariots, including the prince's, more than 2000 horses, thousands of other animals, millions of bushels of grain, an impressive pile of armor, and thousands of captives. The Egyptians next went north where they captured 3 Lebanese fortresses, Inunamu, Anaugas, and Hurankal. A History of the Ancient Egyptians, by James Henry Breasted. New York: 1908. Charles Scribner's Sons. Ancient Records of Egypt: Historical Documents Volume II The Eighteenth Dynasty, by James Henry Breasted. Chicago: 1906. The University of Chicago Press. History of Egypt, Chaldea, Syria, Babylonia, and Assyria, Vol. IV. by G. Maspero. London: Grolier Society: 1903-1904. "A Gate Inscription from Karnak and Egyptian Involvement in Western Asia during the Early 18th Dynasty," by Donald B. Redford. Journal of the American Oriental Society, Vol. 99, No. 2. (Apr. - Jun. 1979), pp. 270-287. "The Battle of Megiddo," by R. O. Faulkner. The Journal of Egyptian Archaeology, Vol. 28. (Dec. 1942), pp. 2-15. "The Egyptian Empire in Palestine: A Reassessment," by James M. Weinstein. Bulletin of the American Schools of Oriental Research, No. 241. (Winter, 1981), pp. 1-28.